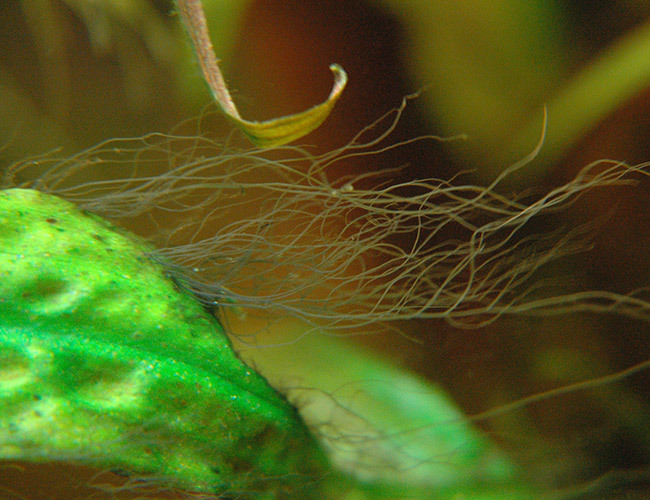 Are you staring at a tangled mess that is growing all over your aquarium plants? You might have Staghorn algae. 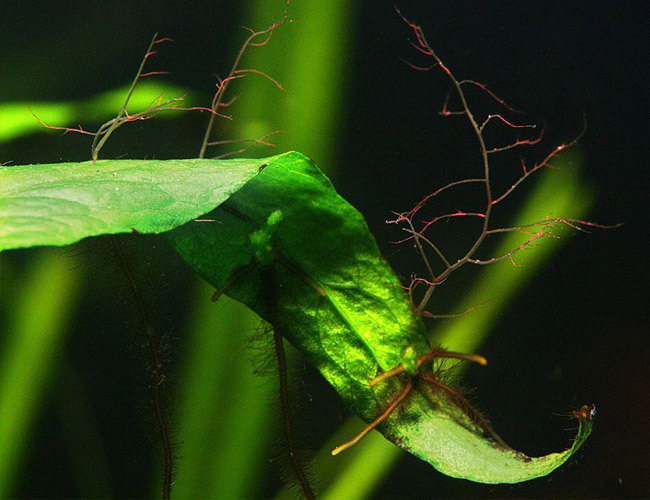 This branching growth, if left unchecked, can take over your entire tank! Today, I am going to show you how to identify it, get rid of it and stop it from coming back! 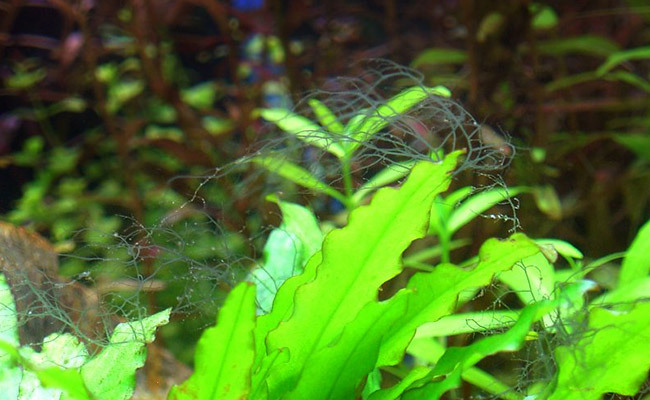 Is Staghorn algae harmful to fish? Is Staghorn algae harmful to plants? What is the cause of Staghorn algae? How do you get rid of Staghorn algae? 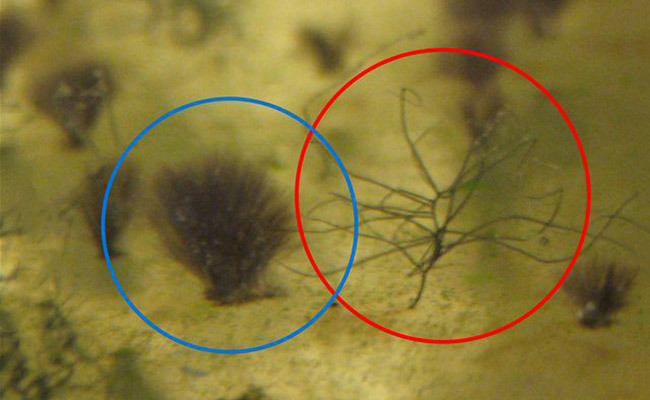 It’s easy to see why this algae is named after the antlers of a male deer. The branching growth of Staghorn algae would not look out of place on the head of a deer. Healthy Staghorn algae is typically a dark gray (almost brown), light gray or white color. However, this algae can look slightly green depending on your lighting setup. Don’t be fooled by the color, Staghorn algae is actually a member of the red algae family. Staghorn algae most commonly grows on plants, although I have seen cases where it attached itself to rocks, aquarium decorations and even a filter pipe. 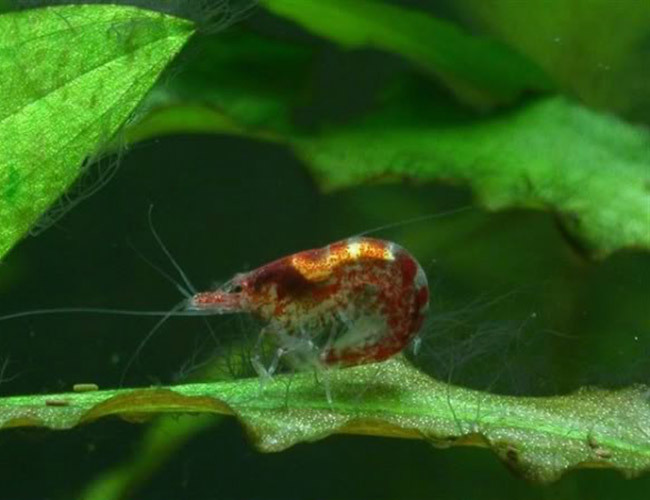 …So tiny, it can easily be missed among the much larger plants in your aquarium. And outside of the water, Staghorn algae still looks like antlers! Staghorn algae is often confused with black beard algae. 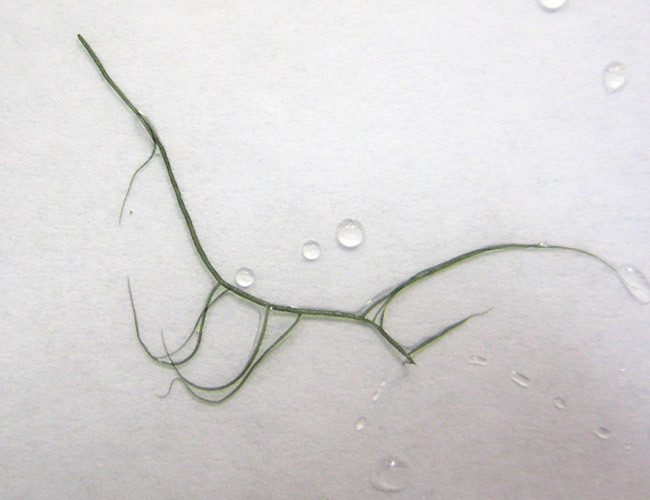 And, I can understand why – fully grown Staghorn algae looks like a wiry beard. 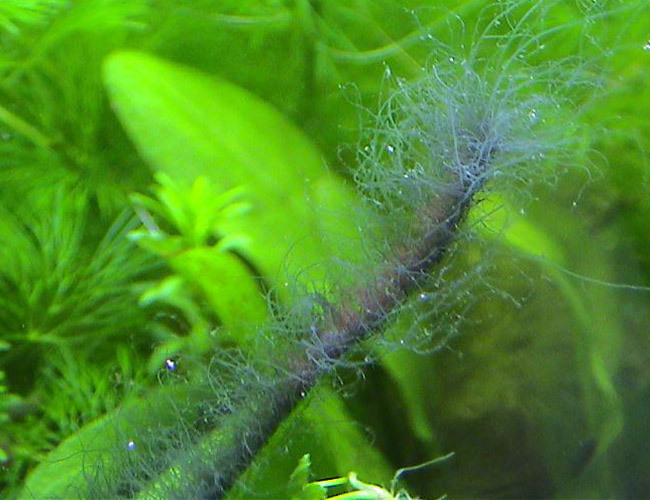 In fact, it often looks more like a beard than black beard algae does. So, how do you tell the two apart? Think you have black beard algae in your tank? 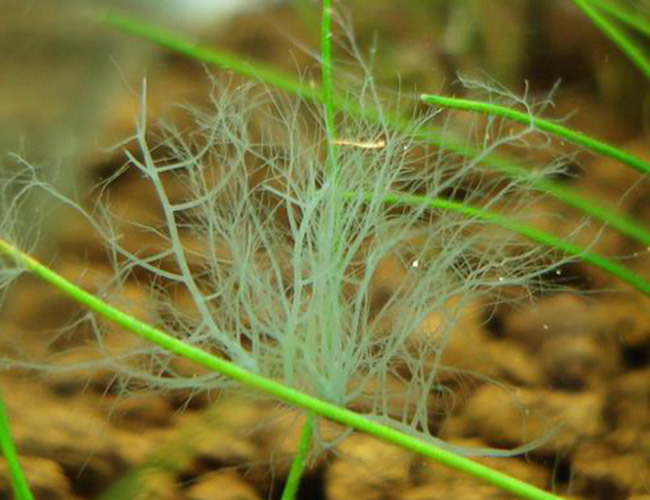 Check out our black beard algae guide – with pictures and instructions on how to get rid of it! Nope, Staghorn algae does not represent a danger to your fish. In fact, if you let your Staghorn algae grow to ridiculous proportions, many fish and shrimp explore its long and bristly growth. In fact, in its early stages of growth, Staghorn algae is hardly a bother at all. But as it grows, Staghorn algae will compete with your plants for nutrients. Any nutrients that the Staghorn algae consumes are not being used by your aquarium plants. Also, if you leave Staghorn algae to grow thick enough, it can block out light from any plants that are unlucky enough to be underneath it. So yeah, an uncontrolled spread of Staghorn algae can be particularly dangerous to plants in your aquarium. It almost feels like Staghorn algae appears by magic. 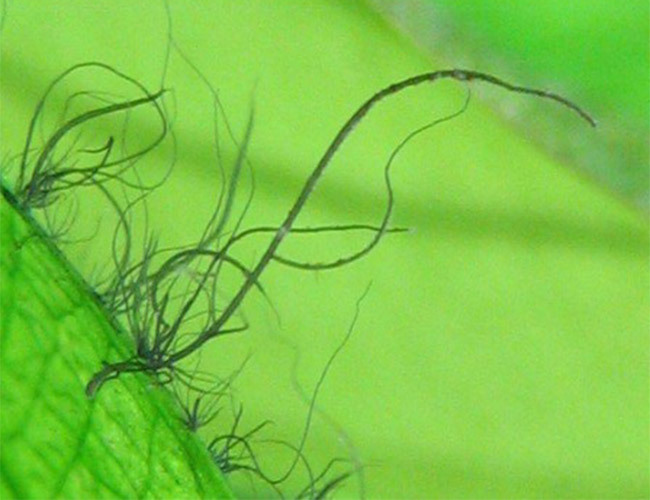 One day your aquarium is algae free, and the next your plants have a gray fuzz growing over them. It is almost universally agreed that low CO2 levels are the primary cause of Staghorn algae appearing. If your CO2 levels are too low or fluctuating, you are creating the perfect environment for Staghorn algae to grow. It could be your CO2 canister is running low, there is a blockage, a leak, or you are not injecting the correct amount. Don’t run a CO2-injected tank? 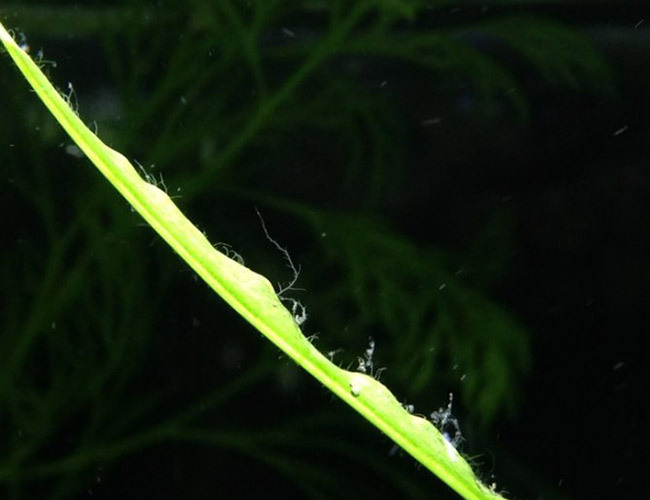 Introduce CO2 to your aquarium by dosing with Seahchem Flourish Excel, which is a simple additive that provides your plants with a source of carbon, and, as I discuss later, can kill Staghorn algae. Okay, so maybe your CO2 levels are just fine. But if you don’t have good water circulation, it’s not going to be able to flow around your entire tank. You see, it’s entirely possible that the Staghorn algae outbreak that you are experiencing is growing in a dead zone. Products such as power heads have been specifically designed to improve water flow by giving it an extra push around your aquarium. If your aquarium has more light than your plants can use, Staghorn algae will happily take over. Do you leave your aquarium light on for long periods of time? Maybe you never turn it off. If so, you are basically encouraging an algae bloom! Reducing the amount of light that shines on your aquarium can slow or even stop Staghorn algae from appearing altogether. But don’t shroud your tank in darkness just yet. You still want to make sure that there is enough light for healthy growth of your aquarium plants. You can use a plug-in aquarium timer to automatically turn your lights on and off each day. It sure beats doing it manually – something that you will certainly forget to do. 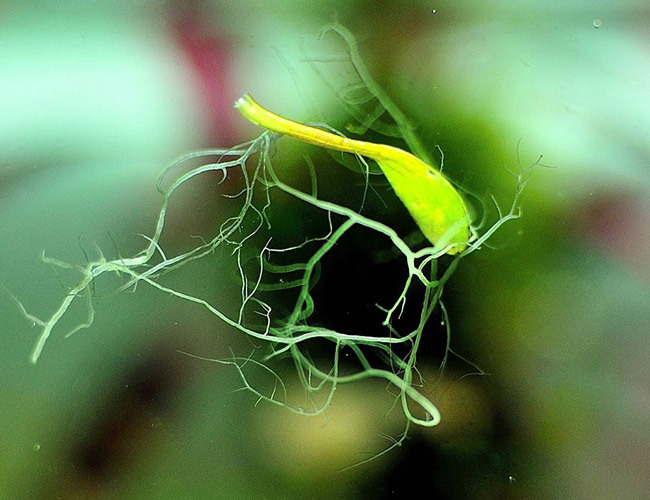 Not only does it kill Staghorn algae, but it will improve the growth of other plants in your aquarium. This will be especially noticeable if you don’t inject CO2. Using it is simple – just follow the instructions and make sure that your water flow is adequate to deliver Excel to every corner of your tank. In under a week, you should notice the Staghorn algae beginning to die. As Staghorn algae dies, it turns a red or pink color. Not noticing any change or want quicker results? Spot treating is the way to go – it can completely kill Staghorn in as few as two days. 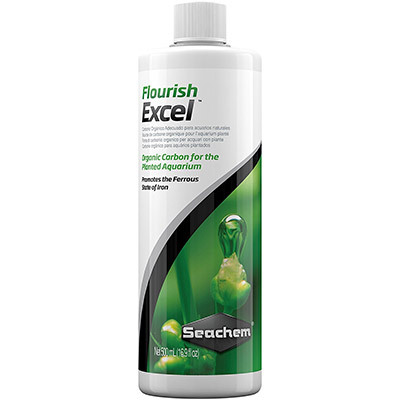 Spot treating involves using a pipette or syringe to apply Seachem Excel Flourish directly to the algae. Daily spot dosing kills Staghorn algae fast. It’s a more extreme treatment, but it has proven to kill Staghorn algae time and time again! Below you see Staghorn algae before being treated with Excel. Continued spot dosing saw this outbreak clear up for good! I personally love the fact that Staghorn algae changes color to red when it dies – it lets you know which areas you missed. Wouldn’t it be great if you could just add a fish to your tank and have it get rid of the Staghorn algae for you? At the time of writing this, I have not found a species of fish, shrimp or snail that will consistently eat Staghorn algae. While your shrimp might nibble on it here and there, they won’t eat it to the point that it is eradicated. However, after Staghorn algae dies, it is not uncommon to see shrimp feast upon its remains. If only they would eat the live stuff! While it may not be harmful to fish, Staghorn algae can definitely have a negative impact on your plants. Not to mention that it looks ugly! However, by taking proper care of your tank, you can prevent Staghorn algae from appearing in the first place. How did you get rid of Staghorn algae? Let me know in the comments below! If you need a follow up dose, I tend to do the same amount of h202. Thanks .. it seems the algae still sticking around even spot treatment. Lights at 4 hr, 10% weekly water change. The 1st 2 time i use 5ml then 1.5 for 2 days. Total 4 days the algae still around. Is any algae turning red and dying off? Are you sure it’s staghorn? I treated wth spot treatment daily 5ml. For some It did turn red. I also did a 2 day blackout and a few drops excel on 2liters bucket for my US fisside and some turn red and some green hair algae gone. Now left a few stings for green hair algae and some staghorn around. Still doing 5ml daily dose. Hi, I’ve been keeping nano tanks for years now and this is the first time I’ve encountered stag horn algae. It seems that it has appeared over night. It’s only in a high flow area of one of my tanks and everything has been constant for 6 months so I’m not sure what’s changed it to make it grow. I’ll have to test my tap water to see if something changed there. Thank you for this article it’s been very helpful and informative. Isn’t surprise algae the worst? I hope testing your water sheds some light on the issue. I have been doing my tank with Excel and it works great. But how do I remove the dead allegra? Does it eventually disappear or should I manually take it out? It all depends on how much algae there was and what you have in your tank. 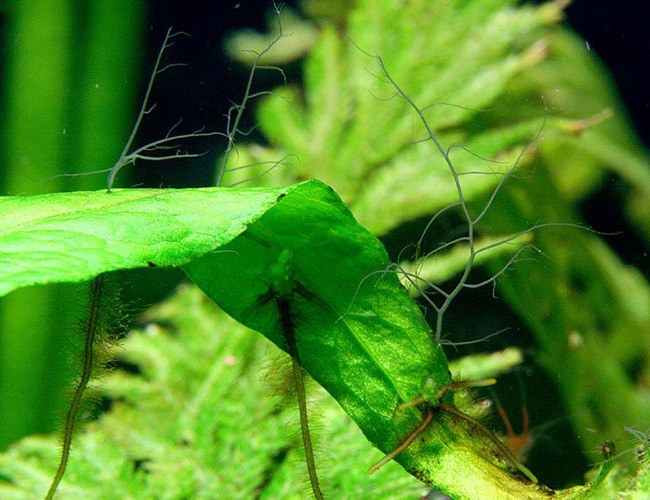 Many shrimp, and some other algae eaters, will happily eat dead staghorn algae until there is none left. If it’s a little, it will slowly break up and go away on it’s own, with much of it being trapped in your filter. If it’s a lot, you might want to manually remove it, doing a small area at a time so you don’t gunk up the rest of your tank. After reading your article on Black Beard Algae, I had to discover what Staghorn Algae is. I’ve had aquariums for 60 years and I have never seen Staghorn Algae in any of my tanks, but I have seen it in other peoples tanks. 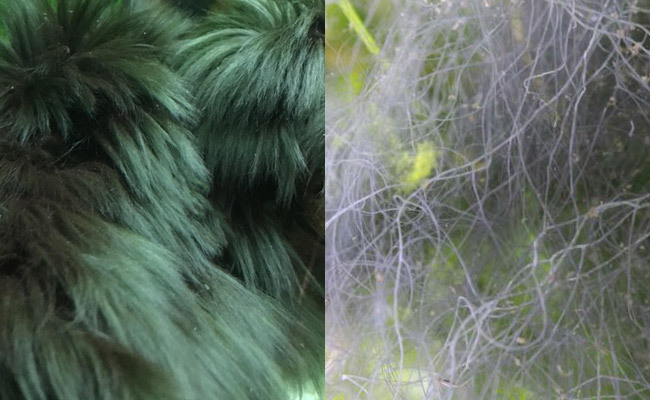 It’s good to see that the solution for Staghorn Algae and Black Beard (Hair) Algae is the same. I’ve been battling Hair Algae for some time now that was introduced from the purchase of a plant from one of the three LFS in this area. I’ve already got other Flourish products (Iron, Comprehensive Supplement) so now I’ve got to get Excel and give it a try. Thanks. Isn’t this hobby fantastic? I’ve been keeping fish for over 30 years and I am still learning new things all the time – and I’ve been doing this half as long as you. I would love to hear your experience with Excel.